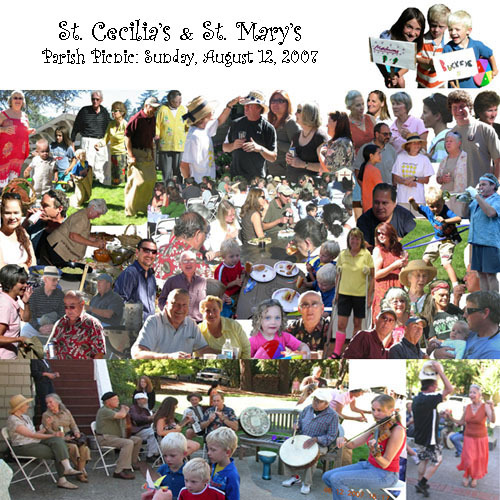 The spontaneous parish picnic at St. Cecilia Church served as a magic sunny afternoon on the prettiest church lawn in remote Marin, with the cutest kids, charming locals, and ideal mixup instruments, sack and potato races, dancers, blackberry pies, meat and hors d'oeuvre, beverages, socializing, all added up to a perfect day in planet earth. The feedback is we should have two picnics throughout the year, one at the beginning of summer, and the other late summer. For those who made this possible, John Beckerley, Cia Donohue, Art Garcia, Guido Mori-Prange, amongst many others. The picnic is in your debt. Special thanks to John Trimble and his musicians.